Question: Will robotics and automation of service task help meet the challenge of the demographic change world wide affecting the operation the hospitals – more patients and less staff? Christian, Robotics are already having beginning effects on the operation of many hospitals worldwide. Mobile robotics (e.g. Swisslog (Speciminder), CCRI (RoboCart), Helpmate, http://www.mobilerobots.com, http://www.aethon.com) are making deliveries throughout hospitals, even using the elevators without human assistance. Robot telemedical systems are making rounds to see patients (Intuitive.com). Surgical robotics are used to provide precision laparoscopic surgery (Da Vinci surgical robots). Pharmacies have been automated for over a decade (McKesson, Scriptpro, Omnicell). Over 600 clinical laboratories are automated worldwide using robot manipulators and conveyors and instruments (Abbott, Beckman Coulter, J&J, Roche, Siemans; and a promising newcomer http://www.lab-ilas.com). However, the linking and coordination of the various robotic systems along with incorporation of the electronic medical record has proven to be a daunting task. The next decade hopefully will see significant increase in the interest and deployment of robotics and automation. A new generation of Chief Technology Officer (CTO) will be needed to understand how to optimally deploy these systems. 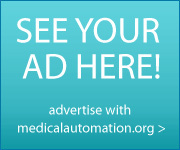 Thus, Medical Automation.org is working to educate and enlighten those who wish to deploy automation. In this regard, Medical Automation hosts TagLine, the Medical Automation web site, and is developing a certification program in medical automation. Although it will take some time to both understand hospital and clinical setting needs, and implement solutions, automation and robotics (A&R) will undoubtedly have a long-term positive impact in healthcare. A&R will have impact from reducing administrative bottlenecks to Improving patient outcomes, and many things in between. We know of various surgical robotics and the military’s vision for battlefield robotic ORs, as well as robots that deliver food, medicines and laundry within larger clinical settings. We need to look at how we can help health care delivery at every level from the most acute such as accident scenes and the battlefield to least acute including home and ambulatory settings. Understanding the workflow process, associated problems, costs and related output of that setting is a start. Analyzing the different venues from top-down and bottom-up approaches should both be effective in identifying opportunities, and finding collaborators who will help make the appropriate solutions a success. So I am essentially saying thorough market research will yield future success. Should anyone be interested, I would be open to a more formal discussion about this.